Bedgasm Hostel i Hanoi, Vietnam: Reservér nu! Located in arguably the best area of Hanoi’s old quarter, Bedgasm Hostel is within walking distance to all the major tourist attraction such as St Joseph’s Cathedral (2 mins), Hoan Kiem Lake (5 mins), Ngoc Son Temple, Dong Xuan Market, Bia Hoi Corner…. 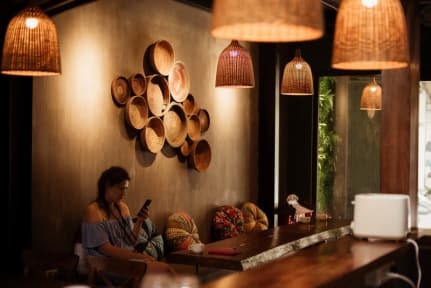 The hostel is also surrounded by chic cafés, local restaurants and street vendors where you can enjoy the most delicious Vietnamese coffee and Pho the city could offer. With the aim to bring the best comfort and convenience to fellow travellers, Bedgasm has a range of mixed, female only dorms as well as private rooms. All of our dorms have high quality 22cm/8inches spring mattresses, premium linens, privacy curtains, power sockets, reading lamps, A/C, wifi and personal lockers. We pride ourselves on top quality sleep! We also have experienced travel experts to plan your stay that will take you to all the hidden treasures this incredible country of Vietnam has to offer. We look forward to having you at Bedgasm! 1. Check in from 14:00 . 2. Check out before 11:30 . The absolute best hostel, we have stayed at so far! Great people, sublime staff, flexible options and facilities + the great location in the Old Quarter here in Ha Noi. Whatever you choose to do here in Ha Noi, this hostel will make your stay in Ha Noi a little better :D Cheers!